We spent the last few weeks overwhelmed by the kindness of our fellow New Yorkers as we received deliveries of toys by the hundreds each day. We completed drives with a record 35 businesses including ING, Macys, New York Life, Lightyear Capital and Rainbow Media Holding; offices; schools; and community organizations. A standout donation was from Francesca, a girl who instead of making a holiday wish list of her own, saved her money and purchased toys for the drive. She also encouraged her friends and family to do the same and with their help brought a truck load of gifts to our offices. In all, we collected over 1,500 toys that were distributed to family homeless shelters across the city. Volunteers from AIG, Golden Strings of Fate, Forbes, and the New York Economic Development Corporation helped wrap the hundreds of gifts for the holiday carnival that took place on December 17th at the UFT. 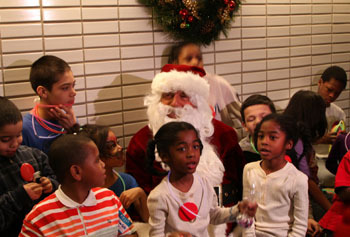 Nearly 200 girls and boys enjoyed games, food, dancing, and gifts, as well as a special visit from Santa….or is that his special helper from Pix 11, Mr. G? Thank you to anyone who sent in a gift, donated money, took the time to volunteer at our carnival or sorted and wrapped toys. With your help, we put smiles on so many children’s faces in a time when they need it most!